Legends don't come close to capturing the incredible story of the coyote In the face of centuries of campaigns of annihilation employing gases, helicopters, and engineered epidemics, coyotes didn't just survive, they thrived, expanding across the continent from Alaska to New York. In the war between humans and coyotes, coyotes have won, hands-down. Coyote America is the illuminating five-million-year biography of this extraordinary animal, from its origins to its apotheosis. It is one of the great epics of our time. Dan Flores is the A. B. Hammond Professor Emeritus of Western History at the University of Montana and the author of ten books on aspects of western US history. Flores lives just outside Santa Fe, New Mexico. "The coyote should have been TIME Magazine's Person of the Year. This deeply engrossing study is part scientific, part mythological, and part personal observation. It is fully fascinating." "Captivating... Dan Flores looks at a creature whose howl sent shivers down the spines of generations of farmers and ranchers. They responded by waging war on an animal that not only refused to disappear, but began showing up in places like Central Park. The coyote turns out to be the Road Runner in disguise, and is having the last laugh after all." "[A] remarkable book... which I highly recommend for all readers who are concerned about the future of wildlife and their environments in North America. Readers will be engaged immediately by the historical, cultural and ecological insights Flores provides with wit and wisdom." "A masterly synthesis of scientific research and personal observation... Much of the charm of Coyote America lies in the interludes in which the author sketches his own evolution from the teenager who thoughtlessly shot a coyote in his native Louisiana to the historian and naturalist whose fascination with the mammal that early travelers called 'the prairie wolf' knows no bounds." "A fascinating new biography of the species." "Historian Dan Flores tracks the pedigree, chronicles the plight, and sings the praises of Canis latrans in his new book, Coyote America: A Natural and Supernatural History. Although his academic research is wide-ranging and his presentation nuanced, there's no doubt Flores' heart is on the side of the animal." "Compassionate and captivating... [Flores] warns us, 'coexistence with coyotes is an essential lesson.' His exuberant book is the lesson plan." "Coyotes have a legendary appeal in North America, from the folklore tales of indigenous tribes to everyone's favorite 'Super Genius,' Wile E. Coyote. In Coyote America, Flores does more than just shed light on the legend; he explores 5 million years of biological history that lead up to the evolution of the modern coyote (Canis latrans) and details the unique versatility of an animal that has continued to thrive despite human campaigns of annihilation." "It is often impossible to separate how animals behave 'wild' from how they behave around humans. Coyotes are a startling example.... Historian Dan Flores has fun describing how coyotes make a mockery of our attempts to put nature in order: 'It turns out, the coyote really is The Dude, and The Dude absolutely abides.'" "Wide-ranging, engaging, informative... Flores is both a fine scholar and a most engaging writer. He argues most persuasively that we need to learn to live with coyote and the other beings with which we share this earth." "Fascinating... essential literature in university courses on environmental studies, wildlife management, and general ecology and public policy. This book will appeal to ecologists as well as to a general audience seeking to better understand how modern humans have treated coyotes and build a new paradigm for a reformed and more holistic vision of how to manage coyotes with respect and compassion... A copy of Coyote America should be given to all legislators to help in making informed and more cost-efficient and humane wildlife policies." "A wonderful read... chock full of detailed information and stories about this most adaptable mammal." "Engaging... provides a unique insight into the age-old war of man vs. wild... [Flores's] storytelling is riddled with humor and tidbits of information that pique interest and make it impossible to put down... From cover to cover, it's a truly thrilling read, leaving readers with a better idea of the way urban development has impacted the world and a desire to protect the existence of animals that have, in more recent days, been labeled dangerous predators. Acting as both a knowledgeable guide and a public service announcement, this book is a must-read for anyone with an interest in animal welfare and environmentalism." "A must-read book if you are interested in knowing more about this persecuted critter, revered by Native Americans long before the settlers arrived." "Coyote America possesses an extraordinary sweep and is an intriguing read." 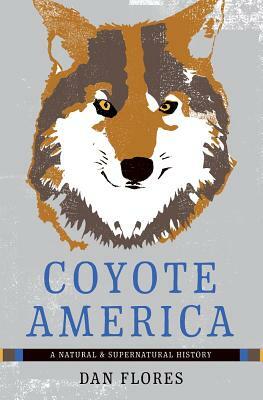 "The most compelling part of Flores' story - and what makes Coyote America an important book - is what it says about the U.S. government's misguided and continuing battle against the coyote." "Flores stares long and deeply into the coyote's eyes, returning to us with cultural treasures both sparkling and lyrical." "A must read for all Americans, whether you are a farmer or rancher, a suburban or city folk." "Historian Flores has written about the American West for decades, so it's no surprise his gaze should turn to the region's scrappy mascot. Over the past 500 years, the original desert-dweller has expanded its territory as far north as Alaska, south into the tropics and deep into many cities. That ubiquity has created a host of problems for both the animal and its neighbors, human and otherwise. Flores captures all sides of the situation in this detailed portrait of an American icon." "[A] fascinating scientific and cultural history.... Deft prose and wide-ranging research do their part to carry Flores through the grimmer chapters of his narrative.... Whatever the coyote may still be wanting, that list no longer includes a book to do it justice." "[An] absorbing book.... The coyote stories in this book are among the best, and Flores is a master storyteller." "In a straightforward style, the author unpacks the myths and urban legends surrounding the coyote and conveys his admiration and respect for this incredibly intelligent predator.... Highly recommended for natural history enthusiasts interested in moving beyond the conventional wisdom about coyotes to gain a deeper understanding of their presence in our midst." "[A] spirited blend of history, anthropology, folklore, and biology that is capable of surprises.... Well written throughout and just the right length, Flores' book makes a welcome primer for living in a land in which coyotes roam freely - in, that is to say, the Coyote America of his title." "Flores's mix of edification and entertainment is a welcome antidote to a creature so often viewed with fear." "In this brilliant book, Flores traces the wane and wax of the coyote. Their story is interwoven with our story, but it is also like our story, that of a species that has faced challenges and overcome them. Read this book if you want to understand the wild canids among us and also, perhaps, a little bit more about yourself." "As I was reading Coyote America by Dan Flores, a coyote walked through our backyard. Magic occurs in these pages." "Dan Flores's Coyote America is an utterly fascinating look at the life and range of Canis latrans. It brilliantly blends environmental history with old-fashioned storytelling. Flores is a master of the American West and a personal hero. A must read!" "Think of Coyote America as a biography of our continent's most enigmatic and successful predator, but don't stop there. It is also a meditation, eloquent and insightful, on our relationship to wildlife, to nature, and even to our national culture. When you've read it, you won't sing the book's praises, you'll howl them." "A biologist once told me, 'When the last man dies, a coyote will be howling over his grave.' This splendid book makes it clear why that's true, and why the persistent, enduring wildness of this remarkable neighbor should give us great delight." "With a deft blend of science and history, Dan Flores shows us the coyote as trickster, survivor, and, ultimately, a reflection of ourselves. Coyote America paints a vivid and long overdue portrait of an iconic animal. It's a terrific book." "A wily writer meets his natural subject. With erudition, pathos, and seductive humor, Dan Flores tells coyote stories that expose the animalism of Americans, and humans everywhere. The pleasure of his book is the cross-species love of being alive."